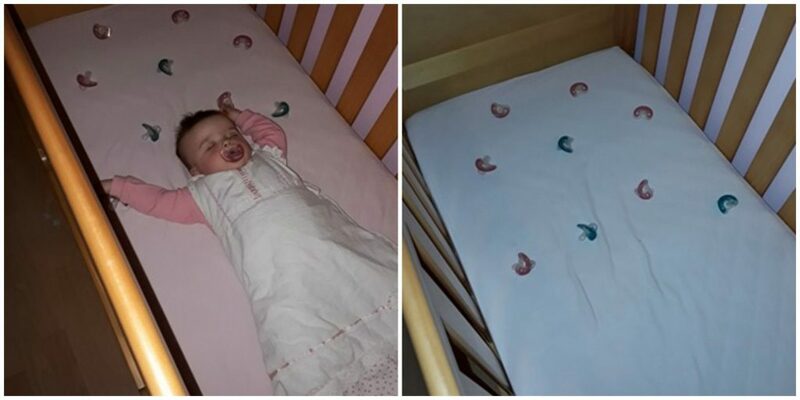 Laura Gerson, a mother from Essex, took to Facebook to reveal the genius hack that keeps her 11-month-old daughter waking during the night. Writing to The Motherload Facebook page, Laura wrote: ‘Since my little one was about 3-months-old she’s gone to bed with roughly 10 dummies in with her. Found that when she cried of a night all she wanted was a dummy then she’d go back off. ‘Realised that if she had one to hand then she would just find it of a night, trial and error with her losing a few down the side but 99% of the time she feels around, finds a dummy, sticks it in and she’s sorted. Since sharing her trick on Facebook, Laura’s post has gone viral with dozens of other mothers praising Laura or chiming in to share their own positive experiences. ‘Why, why, why did I not think of this?! My little one loves his dummy and I am always getting up to put it back in,’ one mother wrote. ‘I do this too—3 up each end of the cot plus one in her mouth and one attached to a comforter,’ another shared.